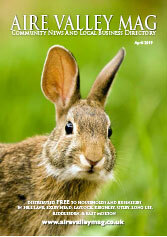 The Worth or Aire Valley Mag delivered anywhere in the UK. FibreValley is a community led campaign to see next generation high speed broadband services universally available to homes, farms and businesses in the Worth Valley, West Yorkshire. the area. From cream teas to chicken tikka masala we have informative and entertaining guides on a monthly basis. 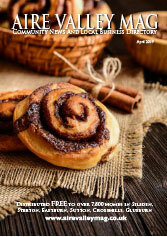 Worth & Aire Valley Mags, your local business directories with a community minded focus. Easter is on the horizon. Many people take the time to have a clear out and spruce up. Spring cleaning comes in different forms. Beth Cunningham has her own unique take on the subject. I suppose, for those who start running in the spring, it is a kind of purge and cleanse for the body. Haworth Physio, David Hanson provides tips for the seasonal jogger. The benefit of keeping a clear, healthy mind, free from anxiety, is not to be underestimated. Hypnotherapist Sharon Thompson reminds us to Choose our Thoughts with Care. And finally, some good news for Haworth as the former Visitor Information Centre is given a new lease and purpose. Have a lovely Easter and a great month. Don’t forget our May edition deadline is May 16th. Phone us today to book your space 01535 642227. As a business or organisation with a presence in the Worth & Aire Valley, we are pleased to offer you the opportunity to be included in the directories. Both editions are FREE monthly publications distributed door-to-door and in bulk drops throughout the region to selected communities. The Aire Valley Mag reaches Keighley Town Centre, Silsden, Steeton, Eastburn, Sutton, Cross Hills, and Glusburn. Aire Valley (Group 3) is delivered to Keighley Central, Utley, Fell Lane, Exley Head, Long Lee, Riddlesden & East Morton. 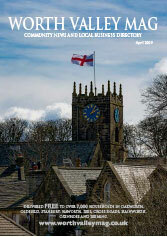 The Worth Valley Mag reaches Haworth, Lees, Cross Roads, Oakworth, Oldfield, Stanbury, Oxenhope and Leeming. The mags are handy guides to local shops, services, products and leisure attractions for residents and visitors to the area. Each edition includes a local business directory, articles, special features, reviews, useful contact numbers, puzzles, an events diary and community pages - all with a special local focus. There is a mix of commericial and free non commercial space available for businesses, non profit organisations, public entities, municiple services, and community groups. we offer incredible value for money. furthering your exposure to visitors to the area (shops community bases and tourist points). The estimated monthly readership is 20,000 for the Aire Valley Mag and over 20,000 for the Worth Valley Mag. For added benefit, the magazine, including your event, advertisement, public notice, or article, will be published on-line for FREE! Also available are banner links to take visitors direct to your own website. The Aire Valley Mag and Worth Valley Mag present you with an effective, affordable communication opportunity that engages the local community and gives your organisation a full month of exposure both offline in the publication and on-line with this website. Most importantly,it gives you the chance to play a vital role in unique publications that aim to strengthen local trade and enhance community spirit. We hope you will join us in this endeavour. Follow the Worth & Aire Valley Mag on Twitter!